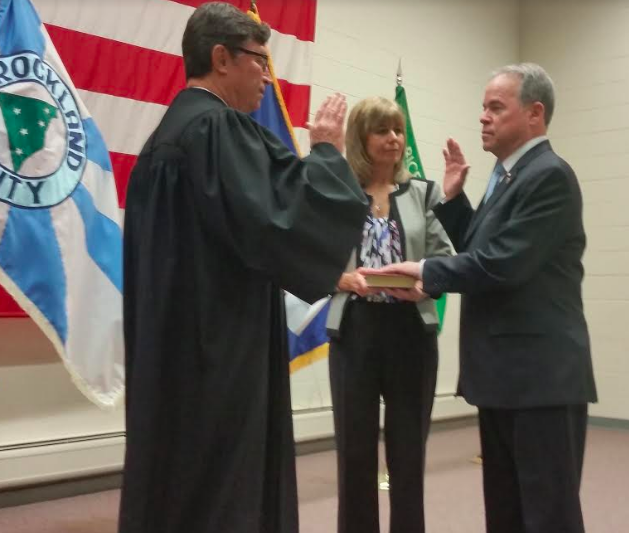 Rockland County Executive Ed Day was sworn in New Year’s Day, officially beginning his second term in office. During a speech following his swearing-in, Day outlined a vision for an “Era of Renewal” in Rockland. He promised to continue to fight against overdevelopment and for strict code enforcement on housing. Day said he wants to build an atmosphere that creates jobs and enhances infrastructure in Rockland. “Today, on the first day of 2018, we celebrate how far Rockland County has come in just four short years and, as importantly, how much more we will achieve going forward,” Day said after taking the oath of office, administered by Clarkstown Justice Craig E. Johns. The county’s deficit has been eliminated under Day’s watch and spending has been cut consistently while taxes have stayed within the state property tax cap, he boasted. The county’s bonds have been upgraded five times since Day took office January 1, 2014 and are now in the A range, he said. Day said the county had success going after slumlords and enforcing a new rental registry during his first term. Day touted the county’s initiative to enforce payment of back taxes by delinquent property owners, like those attempting to develop Patrick Farm in Pomona. While the unpopular project has stalled, developers have had been forced to pay the county hundreds of thousands in owed taxes. Day vowed to work to unite the county, utilizing a “reinvigorated Human Rights Commission” supported by faith-based and community groups.